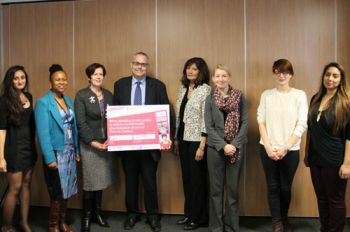 City University London staff and students have marked their commitment to reducing mental health discrimination as part of the Time to Change campaign. Professor Carl Stychin, Dean of City Law School has signed the Time to Change pledge on behalf of City, marking a commitment to supporting students and staff with mental health issues. The Time to Change campaign, run by charities Mind and Rethink, aims to increase understanding of the subject, to reduce stigma and ensure that anyone with a mental health issue feels comfortable seeking support. According to Mind, one in four people in the UK experience mental health problems such as anxiety, depression or stress every year. Carl said about joining the campaign: "As an institution, we pledge our commitment to creating a caring and friendly environment where the wellbeing of staff and students is valued. By joining the Time to Change Campaign we will work to challenge the stigma and discrimination often experienced by those with mental health problems by encouraging positive attitudes towards mental health. This pledge is integral to our educational mission, our commitment to fairness in employment and to our social responsibility towards the promotion of health and wellbeing." Marlis Kornrumpf, Student Union Disability Officer said: "Students seldom feel comfortable enough to come forward and speak out because of the stigma still attached to mental health problems and the lack of knowledge about the subject. Mental health issues can affect any person, from any background and at any stage of their life. Having these issues shouldn't mean students feel they have to give up on their degrees." "This pledge will pave the way for greater understanding of the subject, ensuring the wellbeing of our students and staff and making sure they feel confident speaking up, seeking help and no longer feeling like they are struggling on their own." Alongside speeches from Marlis Kornrumpf and Professor Carl Stychin, the Time to Change seminar also saw a presentation by Dr Claire Henderson, Clinical Senior Lecturer at King's College London. The City Mental Health Service offers a wide range of support from counselling to study skills tutoring. Visit the website for more details.